The vehicle identification number (VIN)is the legal identifier for your vehicle.This number is on the left top of theinstrument panel, and can be seenthrough the windshield from outside. This is the primary identification numberfor your Toyota. It is used in registeringthe ownership of your vehicle. The vehicle identification number (VIN) isalso on the Certification Label. 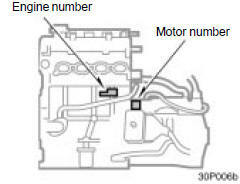 The engine and motor number platesare installed on the engine and transaxlecase as shown.